There has been a lot of talk about tutu's in our house over the past couple of weeks, as M prepares for next term's dance classes. I've promised to make M a new tutu, to her specification, and so I set to cutting and gathering tulle in earnest on Sunday. I had hoped that Dave might take M out for a bit, but she had other ideas and so we started working on another tutu project for her toy horse, Neigh. A rummage in my scrap bag turned up some net curtain I'd bought many years ago as a floaty overlayer for a gown. This turned out to be an ideal choice for a horse. We measured Neigh, with M carefully writing down the horse's waist and 'hip' size, as I demonstrated with the tape measure that the tutu had to open far enough to go over the toy's bottom or it would be impossible to get it on or off. M observed that Neigh has a big bottom and was worried this would make the tutu loose, but I said not to worry, we'd use some elastic. Ah, elastic. This is a mysterious substance that I have minimal experience of and when I have used it, I've never been that impressed. As I want to add elastic to the back of M's tutu, I felt working with elastic for a small toy might be good practice. We talked about how long M wanted Neigh's tutu to be, settling on 15cm as it was easy to find a small rule to match the size. I handed M a pair of pinking shears and suggested she cut strips of net curtain but it turned out the shears needed more oomph than M possessed. She managed to cut a little, but in the end asked that I do it. I threaded up an embroidery needle with buttonhole thread, then showed M how to make a running stitch to gather up the net. M made a valiant effort while I resumed cutting tulle for her tutu. Lots of 'Oh dear's followed as the needle was pulled off the thread, prompting me to suggest M rethread it herself if she could... Much excitement followed when M did indeed manage to thread the needle herself, only to pull it free of the thread again on the next stitch. M persevered for about 30 minutes, before handing the little tutu to me, so I could finish gathering the remaining pieces of netting. Next up I found some ribbon, showing M how to fold it to make a casing, which I then sewed into a loop, sized to go around the toy horse's bottom. M handed me pins and I attached Neigh's tutu to the ribbon. I asked M if she would like to sew the waistband herself, but she declined, watching me closely instead. I could tell M was impressed when she eyed the sewing machine and suggested "Do you think the sewing machine needs its own tutu?" A short while later, the net was sewn in place, the casing flipped over and secured with a gap for the elastic to be threaded in. The elastic was cut to fit Neigh's waist, with a little extra for a seam allowance. This was wrestled into place and sewn together before I closed the last little gap. 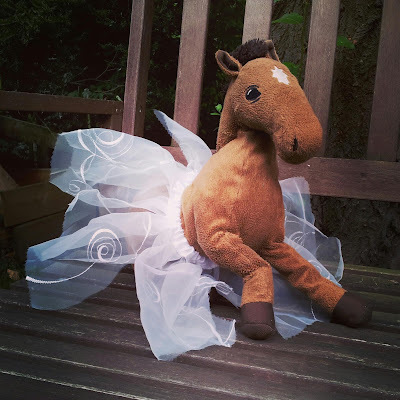 A finished tutu, made to fit a horse. Cue a happy little girl and a happy toy horse.